Quick update on Andrews Sykes (ASY). Summary: These results were very acceptable and extended the improved performance reported during September’s interims. However, the comparison to the weak 2014 figures was always going to look good and, notably, ASY still has work to do to repeat its achievements of 2012 and 2013. While long-term growth may be elusive, the accounts remain in top shape and the generous dividends keep on coming. I continue to hold. These figures were quite satisfactory and continued the improved performance reported in September’s interim statement. For the full year, revenue climbed 6% and operating profit jumped 17%. However, the comparable figures for 2014 were relatively poor after ASY suffered from an “unseasonably mild winter” — which dissuaded many customers from hiring the group’s heaters. During 2015, ASY was buoyed by a hot summer in Europe and December’s widespread UK flooding. The former prompted more Benelux clients to rent air conditioners, while the latter saw the group’s hire-pump division become very busy. All told, ASY’s main UK and European hire operation lifted its profit by 8% to £11.3m. The group’s Middle Eastern unit put in a good show, too, with its profit up 28% to £2.5m. I also welcomed central costs being cut by £0.1m. H1 profit gained 14%, while H2 profit advanced 18%. ASY revealed that it enjoys higher margins from customers hiring its air conditioners, which occurs mainly during H2. Despite ASY’s improved 2015 performance, the group has yet to regain the profit levels achieved only a few years ago. Looking further back, the business appears to have peaked during 2008 when revenue topped £67m and operating profit came to almost £18m. This preliminary statement did not reveal anything too worrying within the accounts. These preliminary accounts were not complete, though, and I will have to study ASY’s full annual report later this month to double-check the group’s working-capital movements and surplus pension contributions. Mind you, I see the year-end balance sheet carried net cash of £14.6m (34p per share) and the cash performance in general supported yet another £5m final dividend (11.9p per share). Also carried on the balance sheet is a trade investment of £164k, that I believe could be worth nearer £3m (see point 6). Sadly this trade investment did not provide ASY with a dividend during 2015 — such income during the past five years has averaged £260k per annum. 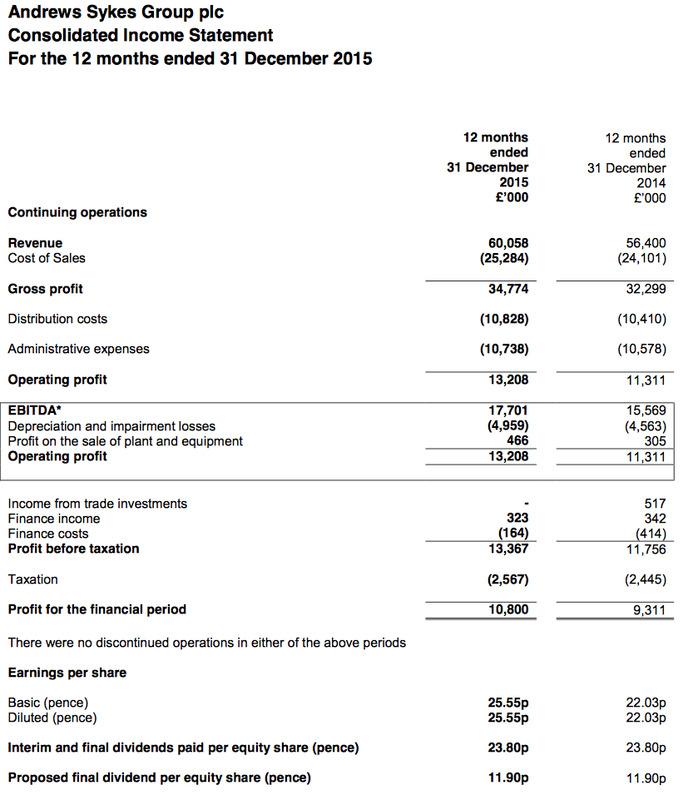 ASY’s trailing operating profit (plus my £260k estimate of average trade-investment dividends) now runs at £13.4m, which translates into earnings of £10.7m or 25.5p per share on a standard 20% tax charge. Subtract the £14.6m net cash position from the £135m market cap and I arrive at an enterprise value of £121m or 286p per share. Divide that 286p by my 25.5p per share earnings guess and the underlying P/E comes to 11. As I have mentioned in my previous ASY posts, I initially bought ASY when the shares were on a P/E of 8. Given ASY’s revenue and profit have essentially stagnated during the last decade, I reckon any further investment requires a similar single-digit rating to make the most of the firm’s ‘cash cow’ attractions. Meanwhile, the trailing 23.8p per share dividend is just about covered by my 25.5p earnings figure — which is why the yield at 320p is 7.4%. 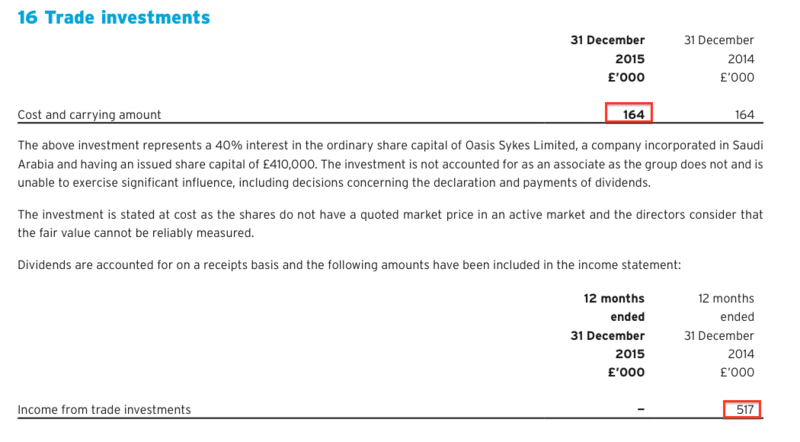 Disclosure: Maynard owns shares in Andrews Sykes. This entry was posted in Andrews Sykes, My Shares and tagged Andrews Sykes, ASY on May 11, 2016 by Maynard Paton. ASY’s latest annual report does include a fair bit of management narrative that was not produced in the original results RNS. However, the additional text did not contain any great revelations from what I could tell. 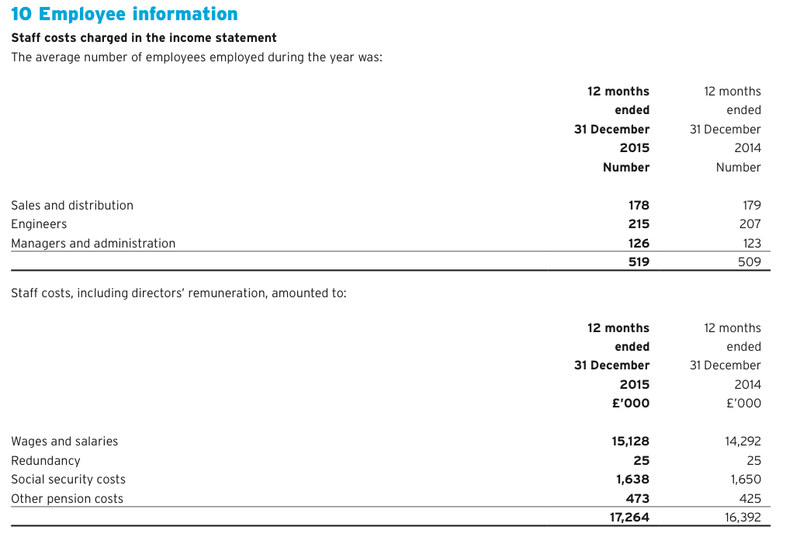 A profit of £11,323k from revenue of £45,600k gives a 24.8% margin before central costs. I suspect this subsidiary’s margin has improved for 2015. A surprise within the 2014 annual report was confirmation of a few extra staff being employed despite revenue dropping 8%. Also, although total staff cost as a proportion of revenue dropped from 29.1% to 28.7%, the percentage remains somewhat higher than the 26.5% or less recorded between 2006 and 2013. I note, too, that the average staff cost per employee advanced £1k to £33.3k — it was £29.8k in 2010. Last year’s ’emoluments’ at £346k compare to £342k, £365k, £345k, £236k, £241k and £191k for the previous six years, during which ASY’s operating profit has mostly bobbed around between £12m and £13m. I would suggest Mr Wood is on a decent whack given the group’s wider performance. At least the 90%-owner/chairman does not draw a fee, and there are no director options. While this trade investment did not pay ASY a dividend in 2015, it did pay ASY dividends of £1,303k during the previous four years and £2,892k during the previous nine years. Given dividends appear haphazard from this investment, I am happy to value the asset based on the average annual dividend received from the last five years. I’m using £260k as per the Blog post above. Even though ASY’s pension scheme showed a £2m surplus at the end of 2015 (up from £1m at the end of 2014), the group has decided to increase its annual scheme contributions from £120k to £936k during 2016. I had hoped ASY’s additional scheme funding had ceased for the time being. It just goes to show how final-salary pension schemes can just keep on absorbing extra cash from companies — even when this scheme was closed ten years ago and its funding projections show an accounting surplus. Just so you know, during the ten years to 2015, ASY pumped £10.3m into the scheme over and above the costs charged to P&L. 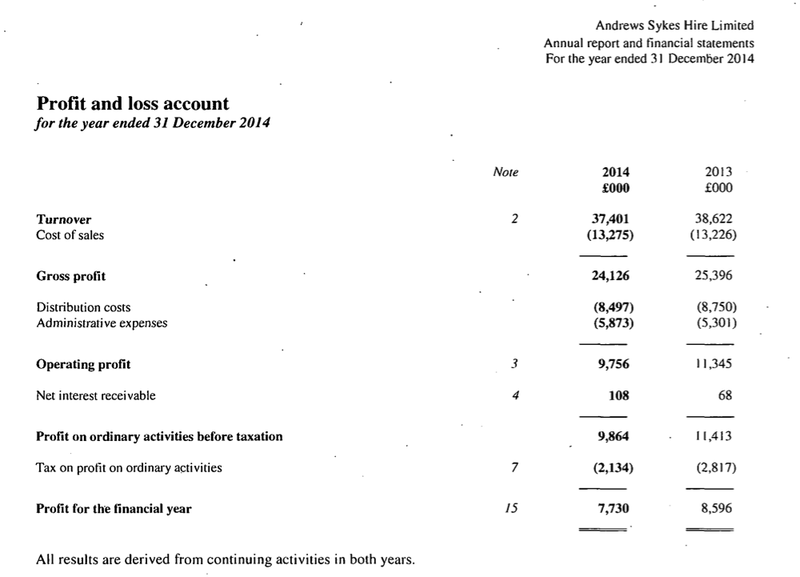 So you could say reported pre-tax profits were overstated by £1m a year. 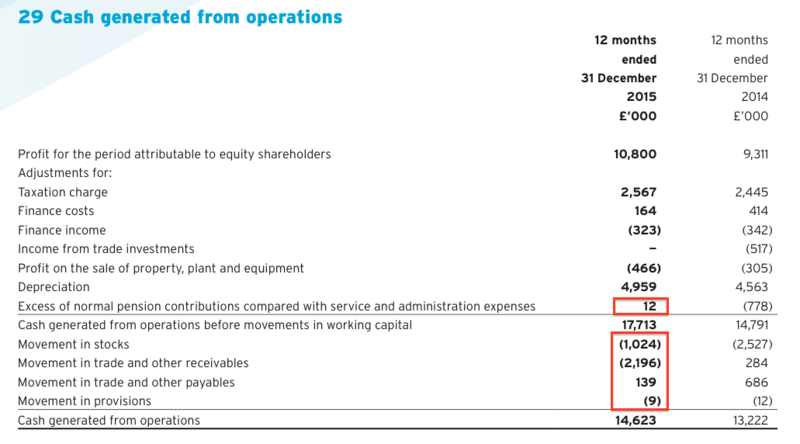 I did say within the above Blog post that I would double-check ASY’s cash flow, including the firm’s working-capital movements and the level of any additional pension-scheme contributions. You can see the ‘excess of normal pension contributions’ shows a positive £12k, which probably reflects the timing of the reduced £12k monthly scheme payment. That £12k is a much more welcome figure than 2014’s negative £778k. “Cash collection from customers was more challenging” does not sound great. The percentage of trade debtors overdue at the year-end was £7,035k from a total of £14,763k, or 47.7% — which seems high to me. That said, the percentage figure was the same for 2014 and higher at 48.3% for 2013. Out of the last ten years, eight years have registered a 40%-plus figure. Trade debtors as a percentage of revenue, at 24.6% (£14,763k / £60,058k) for 2015, is higher than recent years (21%-22%), but has at least been witnessed before (2010 and 2011). So, while ASY’s trade debtors do not signal obvious problems and are not setting worrying new precedents, I do feel they are worth keeping an eye on. I attended this morning’s ASY AGM at the group’s corporate office in central London. This was my first ASY AGM. As usual, this is my best recollection of what was said and my comments below are generally paraphrased. There wasn’t really the opportunity to ask questions ‘from the floor’ after the formal meeting had ended, but I did spend some time with the chief exec and finance director afterwards. Once again on the train home I realised there were a few other questions I should have asked. The board was not in full attendance. Sadly the absentees included the 96-year-old chairman JG Murray, who’s family interests control about 90% of the company. The chairman has a remarkable life history and it was a shame he was not there. But I suppose if i was a 96-year-old multi-millionaire, I would not be too bothered about AGM formalities either. The other non-attendees were three non-execs, Messrs MC Leon, JP Murray and EDOA Sebag, the latter of whom was actually up for re-election. All the resolutions that were proposed were passed without fuss. There were seven people in the stalls, of which four I think were advisors of sorts and three were ordinary shareholders (including me). Clearly the two other shareholders were proper shareholders, as they were on the shareholder register an as such were given voting cards. Being a poor nominee shareholder, I was not given a card and therefore could not hold anything aloft during the votes. * ASY has paid out all of its earnings as dividends during last three years, but company has no formal dividend policy as to what level is paid out every year. Company simply reinvests what is needed and considers any other opportunities, and then takes a view on what to pay out. * Not too optimistic for shareholders to think the business can return to the profit level of £17m that was reported in 2008 (vs £13m for 2015). Business now less dependent on construction sector than it was in 2008, and expansion into Europe has also hindered group profits (investment expenditure charged as incurred). But progress is expected and break-even not that far away for certain European operations. Move into Europe was to remove the dependence on one market (UK). * Middle East operations — debtors here caused the extra working-captial requirements of last year. Generally tardy payers in that area of the world. Middle East division landed four decent projects last year, which bolstered its performance. Mainly pump work. * Still a weather-affected business, with heatwaves, cold snaps and floods in that order being the most profitable. Extended heatwave can apparently add £4-5m of extra revenue. Temps of 27-28 degrees for a couple of weeks can spark notable demand for air-conditioning units. For UK, 25% of revenue last year was air-conditioning, with 40-50% pumps. This year’s summer? “Ahead of last year”. * Consistent high margins (20%-plus) reflect general nature of the hire business. Company has high service levels, so competes less on rates with rivals. Also serves business customers, so lower bad debts and lower inventory loss than dealing direct with the public. * £160k trade investment has paid company dividends of £1m over last five years — surely £160k undervalues this investment? Well, no. Investment is a minority holding in a Saudi business and ASY has “difficult regular dialogue” with the company. Impression I formed is that ASY is frustrated with this investment. Some of the dividends received may reflect more than one year’s payment. * Balance sheet now cash positive for some years now, but no set level of cash buffer determined. Not out of the question to borrow money for investment, expansion or acquisition. Could borrow money easily. Expansion into new regions can be expensive, but capex (equipment) can be repatriated back to UK easily for re-use. * Pension — another £1m to be absorbed by the final salary scheme this year. No indication of contribution levels thereafter, will wait for next funding valuation. Hoping to be able to set a steady contribution level, rather than ad-hoc payments. * Listing — board owns 90% of the shares while the company has no option scheme nor has issued any shares to raise money (at least for a decade). So why have a quote? Governance — quoted firms are tightly regulated and controlling family, who are not involved in the operation of the business, like the higher levels of management governance a stock-market listing can provide. Question has been asked for at least the last ten years. That’s all I can remember. Sadly I couldn’t stay to chit-chat with the other shareholders and directors. On the train home, I thought I should have asked whether the Murray family have any say in the level of dividend. I also realised 2008 revenue of £67m is still much higher than the 2015 revenue of £60m — so I guess that is construction sector activity lost during that time. All told, a useful visit and nothing of any great concern arose.